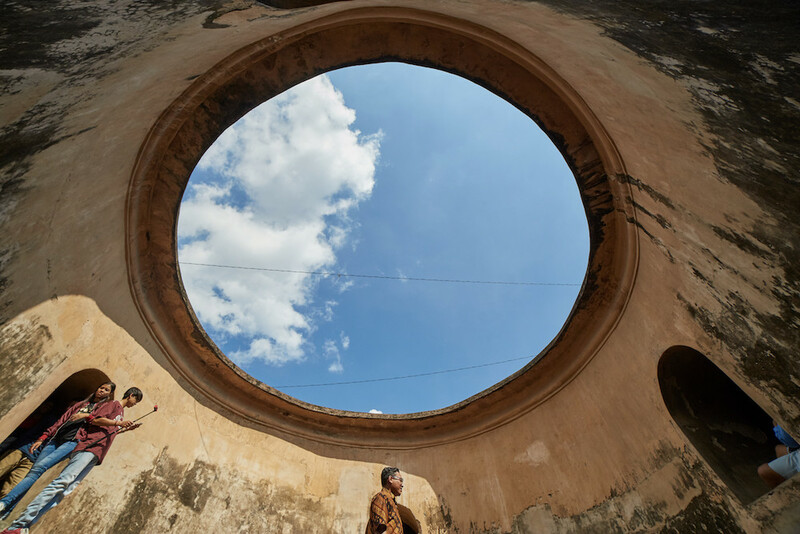 Yogyakarta, a city of 400,000 people in central Java, is fast becoming one of Indonesia’s most popular destinations. Also referred to as the “Special Region of Yogyakarta,” or simply Jogja, the area is actually ruled by its own monarch. The region is perhaps best-known for the ancient monuments of Borobudur and Prambanan, while many also flock to the city to experience its thriving contemporary arts scene. But what traditional sightseeing options does central Jogja have to offer? Some of the highlights include the Taman Sari Water Palace, the Underground Mosque or seeing a traditional shadow puppet performance. 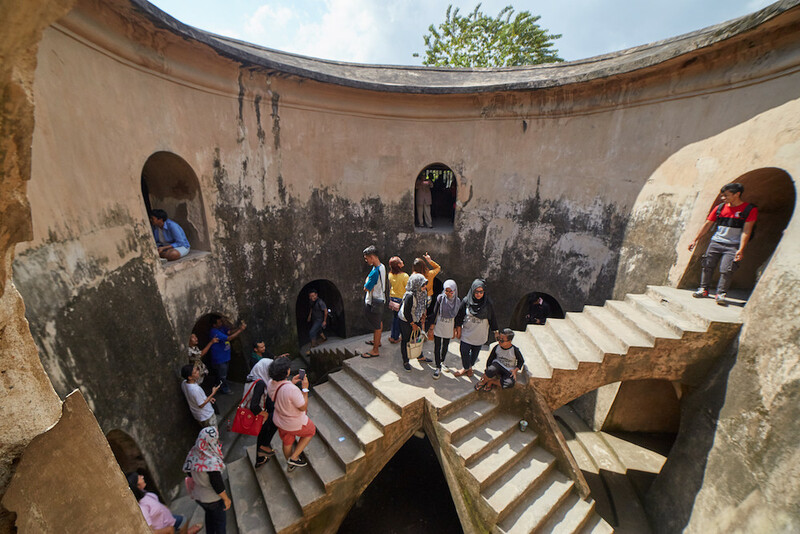 You can easily explore Yogyakarta’s most prominent landmarks in a single day, and it’s certainly worth setting aside time for in between climbing volcanoes or exploring street art. I would recommend basing yourself in the southern part of the city, in or nearby a neighborhood called Mantrijeron. This area is home to some of the city’s best restaurants, cafes, bars, art galleries & street murals. Therefore, this itinerary is going to assume you’re coming from south of the walled city around the sultan’s palace. A lot of people stay on or just off of Malioboro Street which is itself one of the landmarks featured in this guide. To see the city’s main historical sights, Malioboro makes for an excellent base. But in my opinion, it’s not as interesting overall as the southern districts. If you’re based there, use the map for reference and you should have no problem getting around to the places mentioned in this itinerary. Our first destination is going to be the Taman Sari Water Palace. As you approach the walled city via Jl. Dl Panjaitan street, you’ll have to go through a large white gate. This is known as Plengkung Gading, and you can actually climb up it. The views are kind of a letdown, but it’s still worth a quick look as you pass by. Shortly afterward you’ll approach a green grassy area called Alun-Alun Kidul. We’re going to skip this for now, but keep it in mind for later, as this is a very popular gathering spot to visit at night. From here, Taman Sari is about a 10 minute walk. You could also take a three-wheeled bicycle rickshaw known as a becak. Personally, I’m not a fan of these because the drivers often seem to take strange and extra long routes. This is not part of a scam, because the price is agreed upon beforehand and there’s no real reason for them to use the extra energy, other than having a poor sense of direction. It may still be a fun experience for a ride or two, though. If you don’t want to walk, a good option would be to download the ridesharing app called Grab and hire a driver through your phone. The entrance to Taman Sari is somewhat tricky to find, and you’ll have to walk through some quiet residential streets before you get there. Someone may approach you and offer to take you there, but it’s likely that they’ll ask for a tip afterward. Just make sure you have a sim card and keep your eye on your GPS. 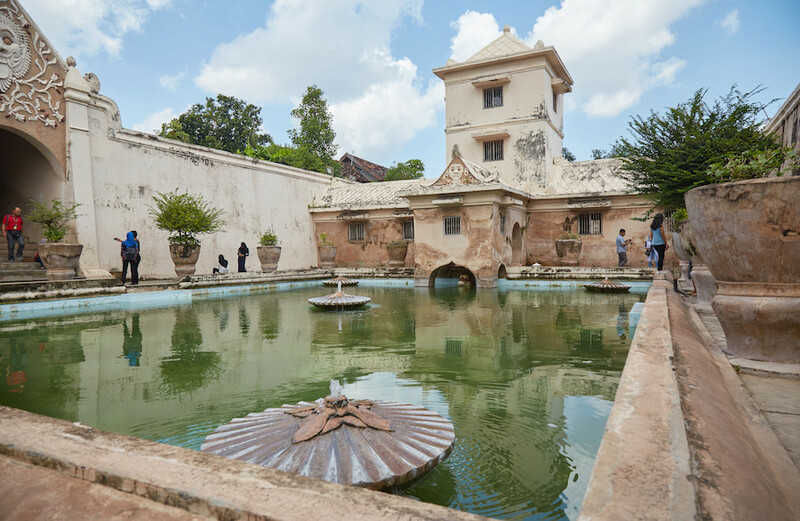 Taman Sari, also known as the ‘Water Palace’ or ‘Water Caste,’ was constructed back in 1765 by Yogyakarta’s very first sultan. 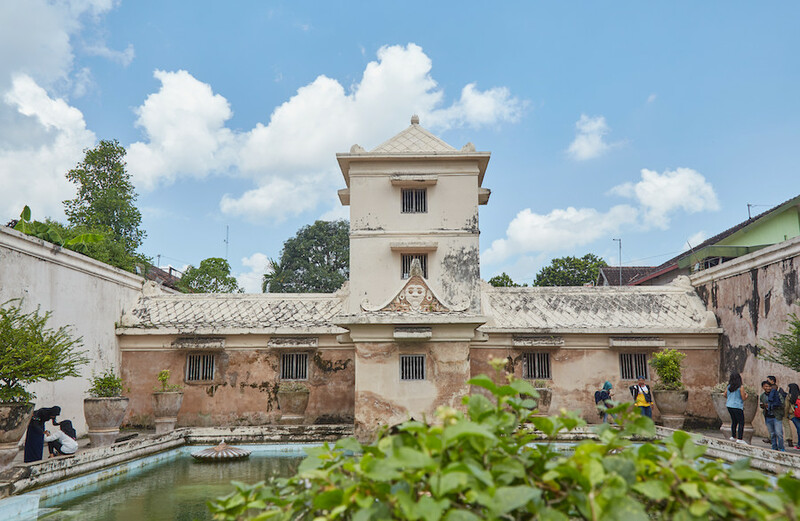 Just around 2km from the sultan’s palace, or kraton, Taman Sari was a multifunctional complex which the royal family used for everything from bathing to meditation. It also acted as a potential hiding place, and underground tunnels were even built to connect different areas of the complex. 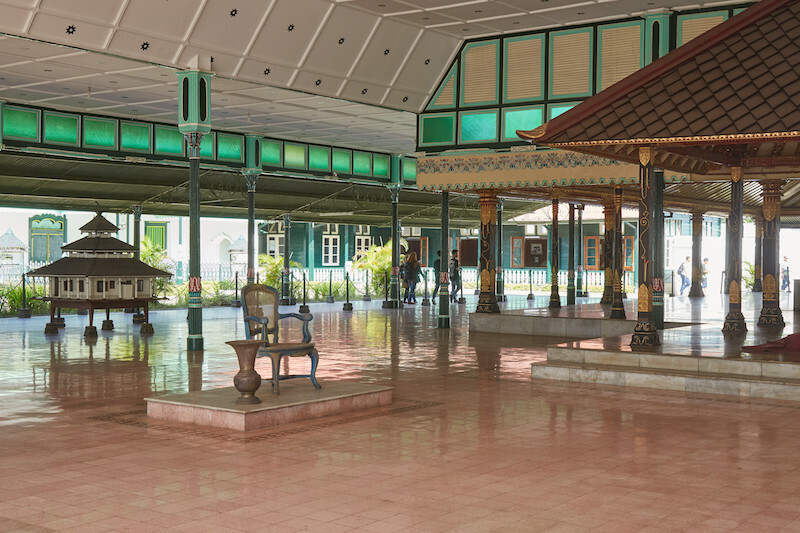 Architecturally, Taman Sari is a blend of Dutch and Javanese styles. One local legend, however, suggests that the water palace may have been built with the help of a shipwrecked Portuguese man found washed up on the southern shore of Parangtritis. 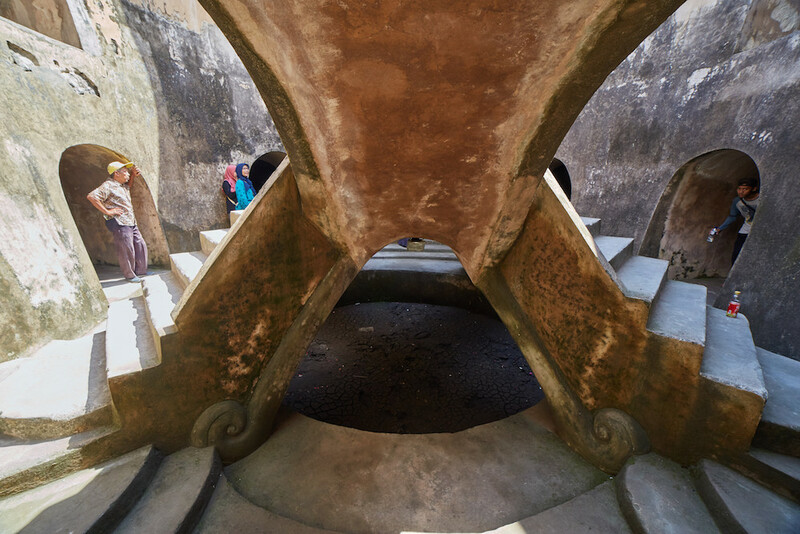 One rumor regarding Taman Sari is that an underground tunnel was built connecting it to the beach of Parangtritis – around 30km away! If this miraculous engineering feat was ever actually pulled off in the 18th century, it’s unlikely that the tunnel survived subsequent earthquakes. Physical tunnel aside, however, the local people do believe that a metaphysical axis connects the south sea, central Jogja and Mt. Merapi. 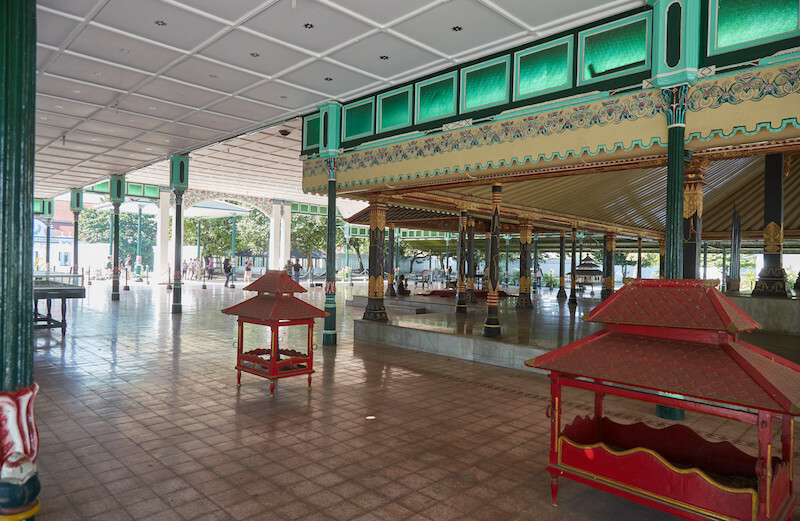 Many of Yogyakarta’s significant landmarks have been deliberately built on top of it, with the sultan’s palace kraton being situated exactly in the center. Taman Sari lost much of its splendor after a devastating earthquake in 1867, damaging many of the structures and draining most of the water. More recently, a large earthquake that struck the region in 2006 caused even more damage. The palace, though, still remains an impressive site and is well worth a visit during your time in Yogyakarta. 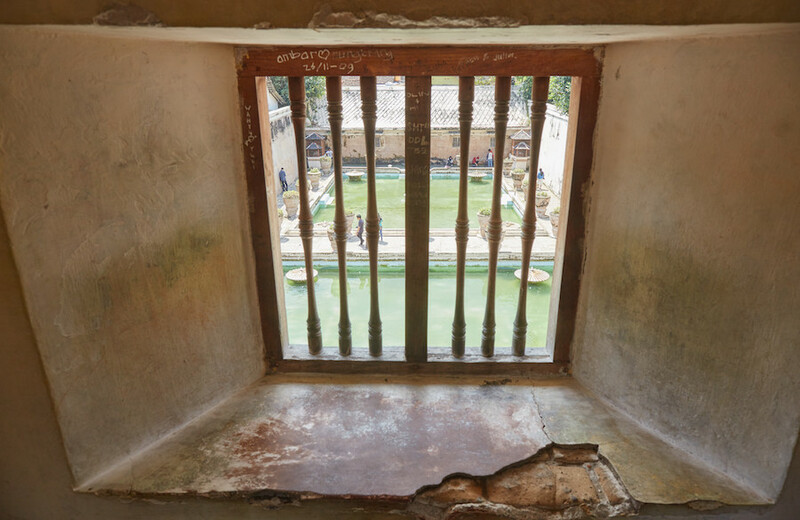 The main water palace area shouldn’t take up much more than 30 – 45 minutes of your time, but be sure to check out the Underground Mosque nearby. 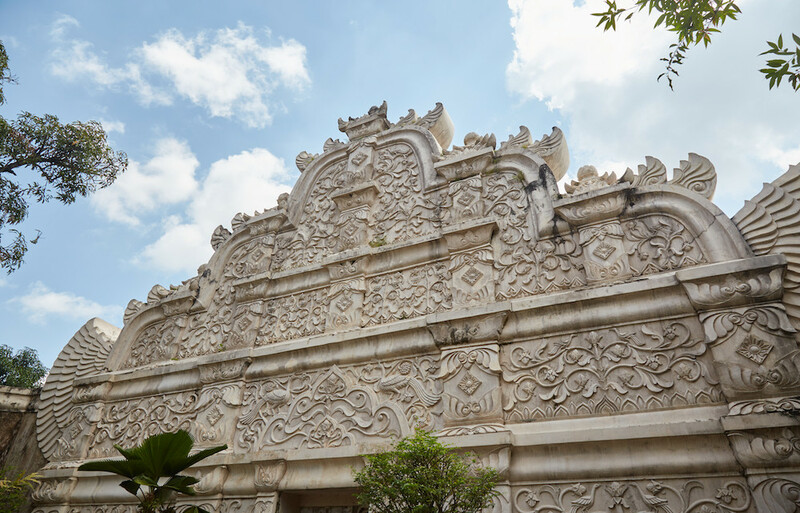 It was originally built as part of the same extravagant Taman Sari complex. Just to the north of Taman Sari is Sumur Gumuling, also known as the Underground Mosque. As mentioned, this was originally built as part of the same Water Palace complex. Sumur Gumiling is absolutely worth checking out and is perhaps the most interesting historical place in all of central Jogja. Sumur Gumuling features a funky staircase in the middle, in which three main series of steps connect to form a pyramid. But there are also two other staircases branching off of it in other directions, supposedly adding up to represent the five pillars of Islam. Meanwhile, a circular opening in the ceiling leaves the center of the mosque exposed to the elements. The walkway all around the center, on the other hand, is dark and mysterious and also has some great acoustics. It’s a curious design that will require viewing at a number of different angles to truly comprehend. This is a popular place for locals to do photo shoots, so a little bit of patience is required before taking photos or using the staircases. Walking outside, you mat also come across some other smaller ruins. The entire residential area surrounding Taman Sari and Sumur Gumuling, in fact, was also once part of the original Water Palace complex. Around the area you can also find some nice murals, gift shops and cozy cafes. When you’re done, let’s head about 600 meters northeast to the Sultan’s Palace. The “Autonomous Special Region” of Yogyakarta, as the name suggests, is a unique region in Indonesia. The city and province surrounding it are governed by a sultan, the tenth of which is currently in power. Yogyakarta was granted the right to rule itself autonomously as thanks for the ninth sultan’s efforts in the struggle against Dutch colonial rule. The sultan’s palace sits directly in the center of not just the city but the entire province. Situated right in between Mt. Merapi and the ocean, the kraton was also believed to have been built right on the epicenter of the magical axis which connects the two. As fascinating as the history and mythology of the kraton is, the palace as a tourist destination leaves a little to be desired. Confusingly, the palace has two different entrances that both have different opening and closing times. The front entrance is legitimate, while there is still some debate over whether the back entrance is legit or a scam. I approached the area on foot and was told by a man that the main entrance was closed, but I could still pay a fee to see the back area of the palace. I was confused, but saw that there was an official ticket vendor just next to the entrance he was referring to, so I didn’t see how it could be a scam. Would the sultan himself really allow a fake ticket booth, staffed by people in uniform, to operate at his palace? At the end of my tour in English, which was very informative, the guide tried to convince me to visit a batik shop that’s well-known as a scam in the city – the Ori Gallery. The fact that the seat of the Yogyakarta government would either be allowing or actively participating in a scam left a bad taste in my mouth. However, it’s still hard to say if the back entrance itself is really a scam or not. I only paid around half of one US dollar and got a tour included, so I wouldn’t say I was cheated. The whole ordeal, though, left me not wanting to come back another day to visit the main entrance. During your visit, the guide will explain the history of the palace and the reason it was built on the location it was. 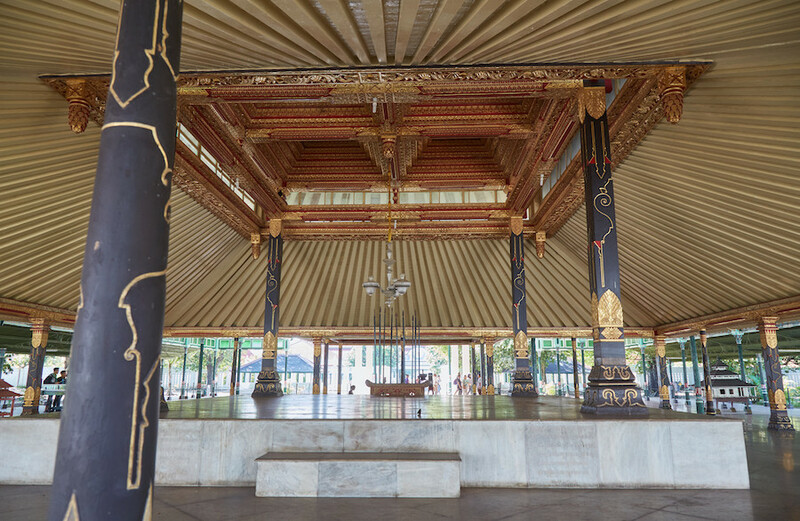 You’ll see a pavilion used for musical performances, and while you may not learn this from your guide, it’s worth noting that the famous artist Walter Spies lived here for a time, working for the sultan as he studied and notated traditional gamelan music. If you’d like to see a musical performance while in Jogja, there are many performances taking place at the palace from around 10:00am each day. 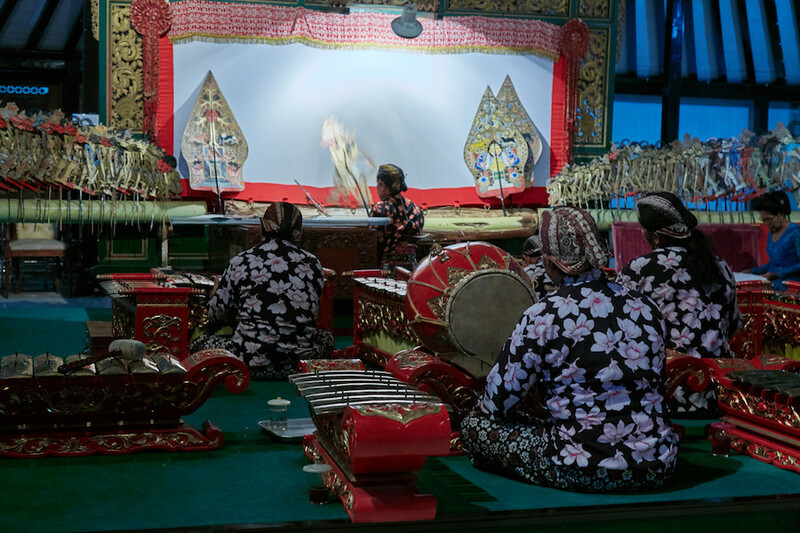 And as mentioned below, you can catch a shadow puppet and gamelan performance nightly at the Sonobudoyo Museum. Leaving the palace, head north and exit the square walled city. You shouldn’t have much trouble finding Jl. Malioboro street which runs north-south (along the same ‘magical axis’). This is considered the city’s main shopping and eating street and is worth a visit at least once during your time in Jogja. The street was originally constructed as a thoroughfare between the sultan’s palace and Mt. Merapi. Today, the busy street is one of the city’s main tourist attractions in addition to being a popular hangout spot for locals. Aside from food and drink, this is a place to take a ride on a horse-drawn carriage or shop for souvenirs. There are loads of t-shirts available for sale here, but if you’re looking for a unique design you should try out some of the independent art galleries instead. Continuing north up Jl. Malioboro (you may want to take a taxi), you’ll eventually find yourself at the Tugu Monument, one of the most recognizable symbols of the city. Just like all the other notable historical landmarks in Jogja, this monument was originally built by the first sultan, Hamengkubuwana I. The monument that stands at the intersection today isn’t how it originally looked, however. The original monument was another one of the structures destroyed by the 1867 earthquake, and the newer monument that’s replaced it is a good 10 meters shorter than the original. The monument was first built to symbolize the Javanese struggle against foreign invaders while at the same time being strategically placed along the ‘magic axis’ which runs through Mt. Merapi, the kraton and Parangtritis beach. Benches are conveniently placed near the intersection so you can relax and watch the monument as busy traffic swirls around it. While not incredibly exciting, sitting and watching the monument in the evening can make for a relaxing end to a hot and busy day. 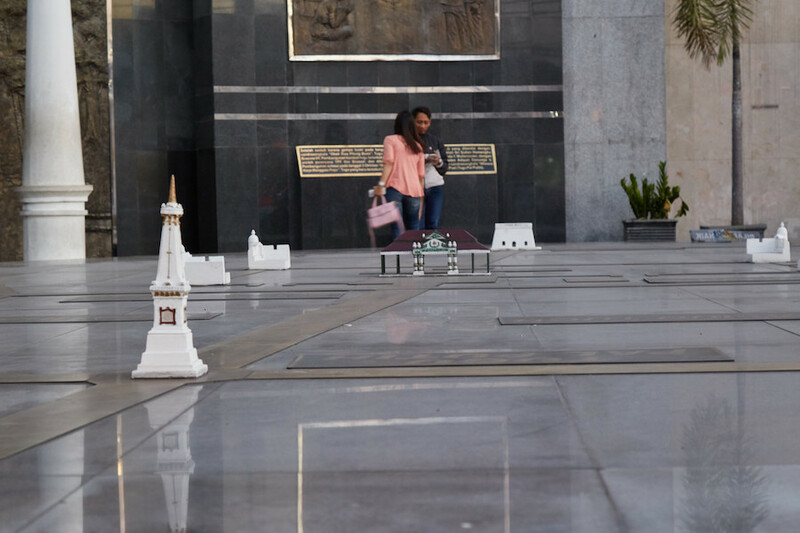 There are plenty of restaurants and cafes around the monument, and you’re still just a short walk from returning to the bustle of Malioboro Street. Yogyakarta has plenty of nighttime options to satisfy a wide range of tastes. Jl. Malioboro itself is a popular nightlife spot. Here you’ll find some bars and restaurants and it’s a great place to people watch. But if you’re looking for something different, the options below are other fun ways to spend your evenings in Jogja. 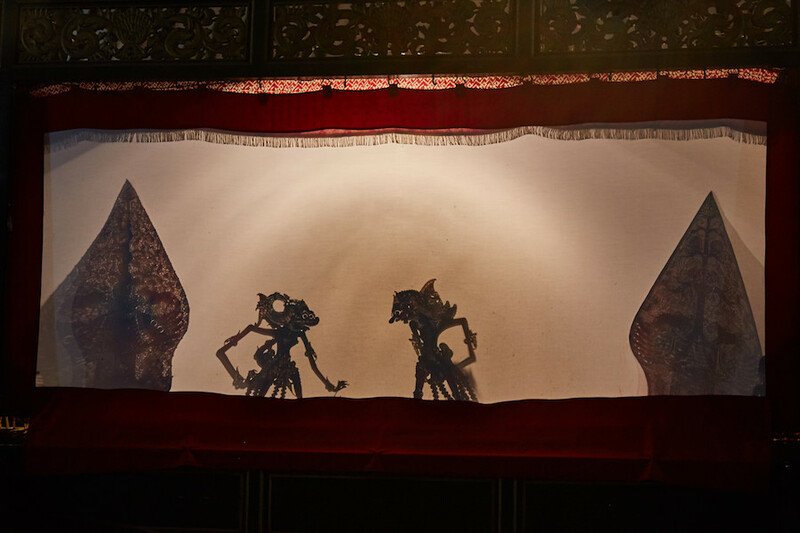 Every evening at the Museum Sonobudoyo, you can see a traditional shadow puppet performance between 20:00 and 22:00. At Rp. 22,000, the entrance fee is very reasonable and it’s no big deal if you arrive late or leave early. There are seats on both sides of the stage, meaning you can see the puppets from the traditional perspective of the audience (i.e, their shadow form) or from behind the stage. This allows you to see exactly what the puppet master is doing, and you can also watch the large gamelan orchestra perform their hypnotic traditional music. Bar Hopping & Live Music on Jl. Prawirotaman St. The area around Jl. Tirtodipuran and Jl. 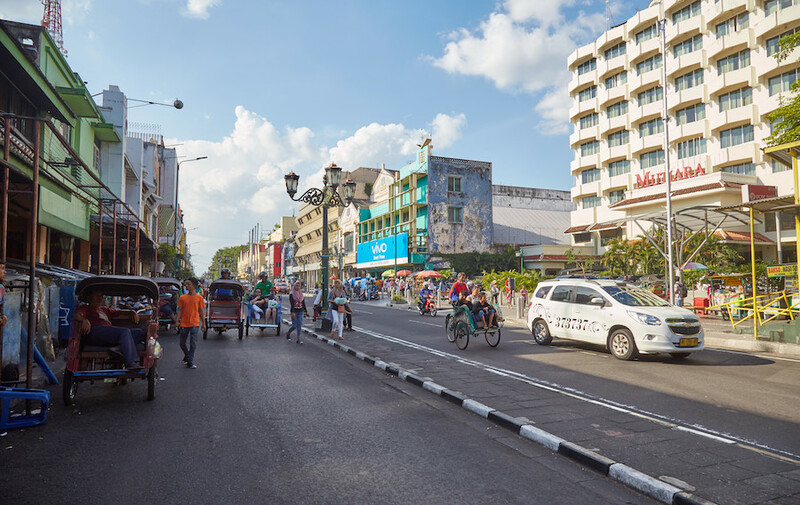 Prawirotaman street (the same east-west street that changes names a couple times) is where you’ll want to visit to experience live music or bars. The Jl. Tirtodipuran portion is a little quieter but has some great restaurants. Further east on Jl. Prawirotaman and intersecting streets, there are dozens of bars to choose from and you can also listen to some local cover bands if that’s your thing. This grassy field is home to some local legends and a popular game in which a blindfolded participant attempts to walk in between two large trees. At night this becomes a lively gathering spot with food stalls, music and people having late night picnics on the grass. The first thing you’ll notice, though, are the wacky neon peddle cars which feature colorful and cute characters. You can even hop in one if you so desire, but your route will be restricted to the road around the field. Yogyakarta is not a huge city, and despite its lack of a metro system, the city is easy to get around. The route outlined above can all be traversed on foot, but you’ll surely want some kind of vehicle to get back to the southern districts. As mentioned above, a common way to get around is by becak bicycle rickshaw. These are everywhere in the city and are easy to take to get to the major sites, but the drivers often take strange or extra long routes for lesser known destinations. Understand that you will need to haggle for each ride. You can also rent a bicycle or motorbike during your stay. The traffic in Jogja is not as crazy as in Bali or Jakarta, but you might want to think twice if you’ve never driven on Indonesia roads before. Ridesharing services are a big deal in Java and this makes getting around Yogyakarta a breeze. While Uber exists, this shouldn’t be your first choice, as there aren’t many drivers using it. You’ll want to download an app called ‘Grab,’ which is the most prominent ridesharing app in Southeast Asia. Indonesia even has its own ridesharing app called GoJek. This app specializes in motorbike taxis but supposedly there’s also the option to hire a car. I could never get the activation code to work, though, so I wasn’t able to use it, and other people I met complained of the same thing. You’ll be fine with just using Grab, though. The cars typically arrive in under 5 minutes and rides are incredibly cheap. Most English information online will mention Malioboro Street as the place to be. It’s true that there are many hotels there and it’s a convenient location that will suit you fine. I’d recommend staying further south, however. If you’re at all interested in checking out Yogyakarta’s amazing contemporary art scene, I’d recommend staying somewhere near Jl. Tirtodipuran or Jl. 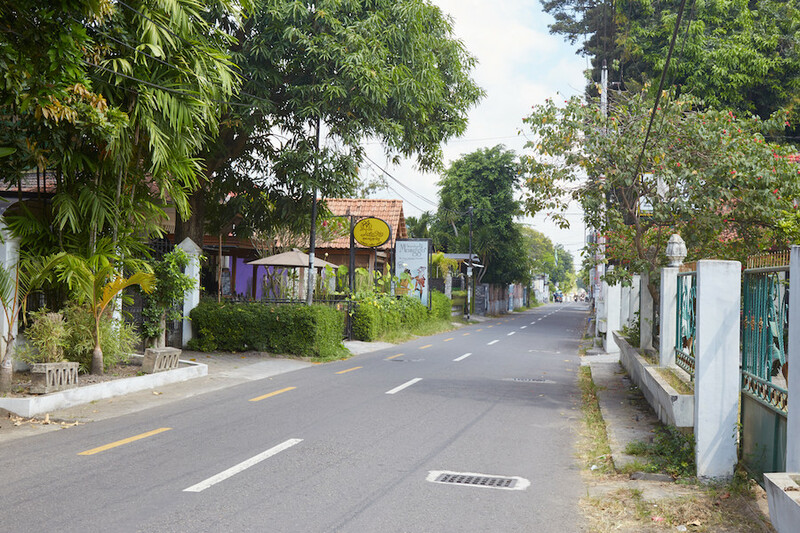 Prawirotaman streets. There are plenty of accommodation options here in addition to restaurants, nightlife and fantastic art galleries. Yogyakarta is easily reachable by plane. You can fly to Adisucipto International Airport from Jakarta, Denpasar (Bali) and other large Indonesian cities. You can also fly directly to and from Kuala Lumpur or Singapore. The city is also accessible by either train or bus, with trips from Jakarta lasting about 12 hours. Many people head further east after their time in Jogja, and it should be fairly easy to find a bus route to wherever it is you’re going.